In case you didn't know, this is the Portland, Oregon temple for the Church of Jesus Christ of Latter-day Saints. It was a cloudy, but nice day and we wanted to go to the Woodburn Tulip Festival, but decided to stay close to home and see the flowers at the temple instead. I'm so glad we did. We only saw a few people there, since it was Sunday and was closed. We felt like we had the place to ourselves. Very peaceful, very beautiful. My brother and his wife were married here and it is a very special place. Parker was upset that he couldn't go inside. I let him know he could someday. Grant and I took turns being photographer and tried to capture some moments with Parker. These are our best shots. This tree is around the corner from our house. It has the pinkest blossoms of any other I've seen. He's saying, "SHOE!"... one of his favorite words. Sometimes when he wakes up and I walk in his room, he just yells out a word he knows and shoe is often the word of choice. Having fun making faces through the screen. Ok, so an orange push pop wasn't the best idea for a car ride, but since we had our sugar-free slurpees, we thought he needed a treat too and thought the push pop was the best way to go. We had better success with a banana popsicle outside a different day. Parker LOVES being outside. I love that we have a nice deck to play on. We would come home from work and daycare and he would immediately go to the screen door to go outside. I know we'll be spending most of our days outside this summer. I'm looking forward to it! 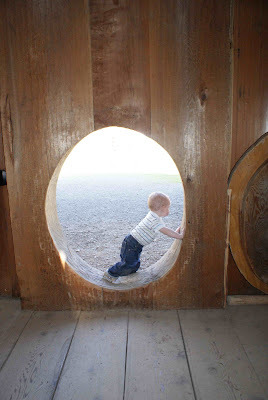 Last month we went up to Ridgefield, Washington to see Aunt Sydney and she took us down the street to the Ridgefield National Wildlife Refuge to see the Cathlapotle Plankhouse. 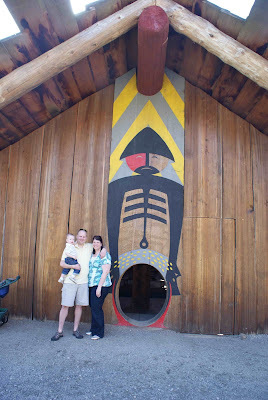 I thought it would be a little cabin, but it was an enormous and impressive building made of sweet smelling cedar. We had a great time exploring, feeling animal pelts, and holding tools that were similar to what the Chinook people used in this area. 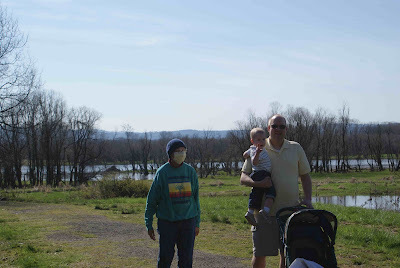 This was Sydney's first big trip out since her stem cell transplant. She is a docent there. It was a great time. The little door was so that if enemies came in they would be crouched and not prepared with their weapons to fight and then the Chinook would have the advantage over them. Neat carvings. 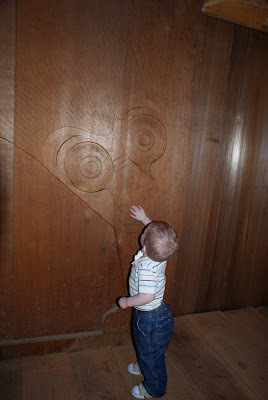 I think Parker liked this one because it kind of resembles a monkey. Parker sneeked away from Grandma to get into Mommy's makeup. He loved rubbing lipstick all over his face. We had lipstick hand prints on our door too. When I first saw these pics I thought it was blood and was upset that my mom didn't call me at work. What a sneeky boy.